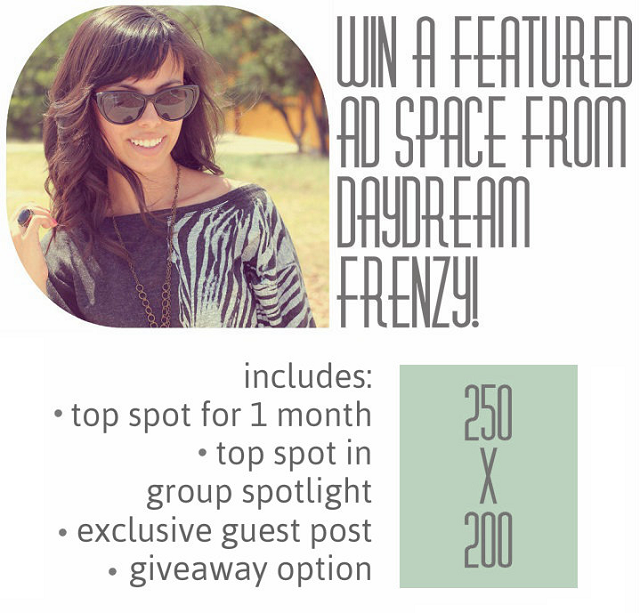 Today I have an international ad space giveaway from Daydream Frenzy. If you didn't get a chance to learn a little about Rachel Emma last week be sure to check out her Q&A post here. Rachel Emma is giving away the featured ad space on her blog. The giveaway will end July 21, 2012 @ 12:01AM EST. Jenelle from Nelle Creations!! Congratulations on your win Jenelle. You are going to love working with Rachel Emma she is so sweet. This is such a lovely giveaway to have and her blog is so chic, really hope I win. I love her outfit posts. And my favorite thing about her blog would probably be her layout/design. It's so pretty and so simple. I have just started reading her blog a week or two ago so it's hard to say what my favourite thing is yet, but her posts are always really interesting! I've been a follower of Daydream Frenzy for a while, but I love her style posts. I also love how her side bar tabs fade in color. I wish I knew how to do that! Love the photography on daydream frenzy! I love Daydream Frenzy! Rachel Emma's style is so cute and flirty and I want all her clothes! I absolutely adore her style. Love looking at her blog for great fashion tips! I love her photos and her effortless pretty style. I am following all over the place! I love Daydream Frenzy and I love your blog. Would love the ad space!!! I love Rachel's style posts the most!